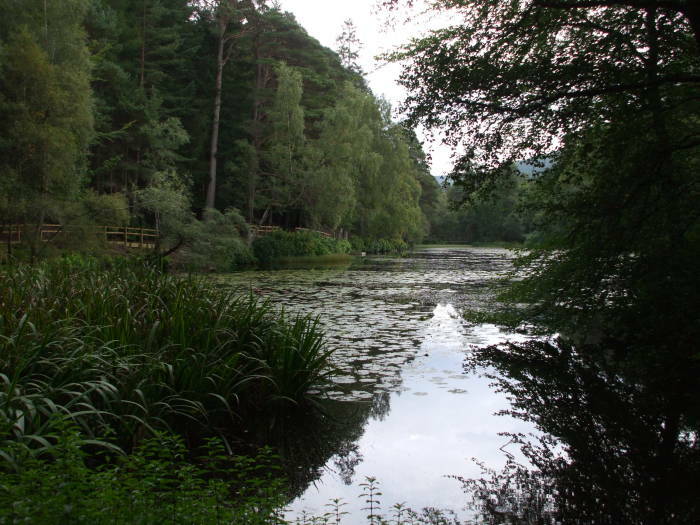 Pitlochry is a Victorian era town in Perth and Kinross, in the southern Highlands of Scotland. 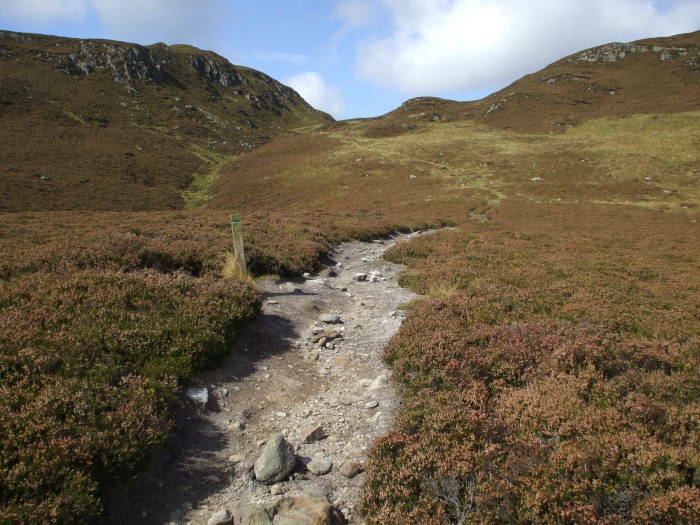 It's a popular area for hillwalking as it's surrounded by low mountains of the southern range of the Grampian Mountains. 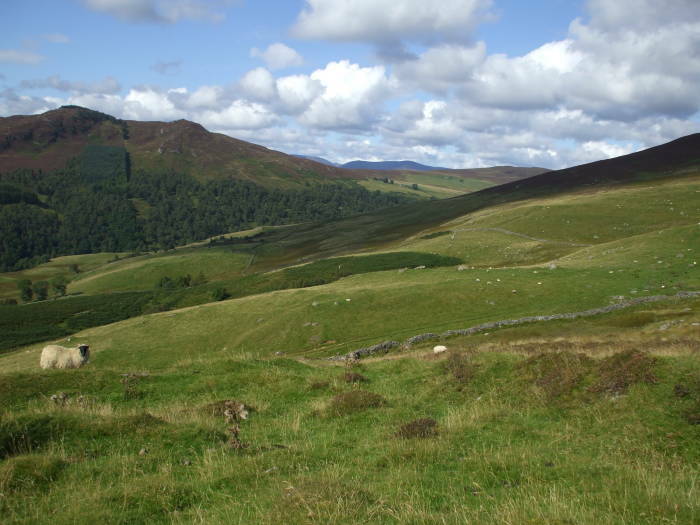 Let's visit Pitlochry and take the Bealach Walk through the village of Moulin, over the ridge of Meall na h-Aodainn Mòire and Meall Uaine, and down to the small village of Killiecrankie. As British locations go, it's relatively new. While Moulin Kirk (Scots for "Church") was granted to Dunfermline Abbey in 1180 and Moulin became a burgh of barony in 1511, Pitlochry itself dates mainly from Victorian times. 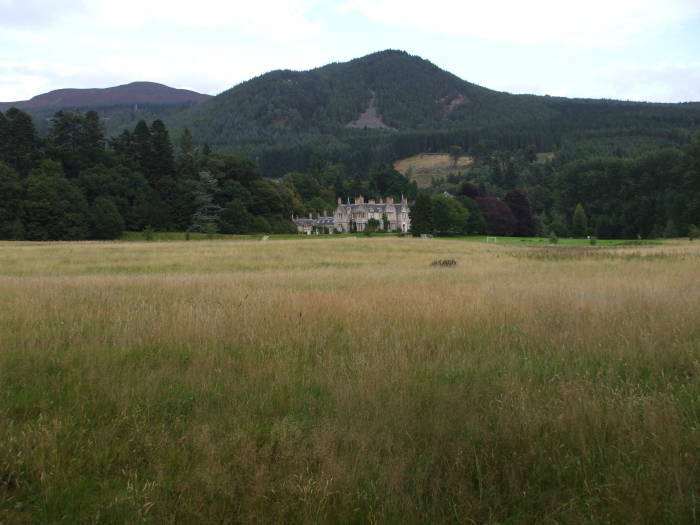 Queen Victoria visited the area in 1842, staying at the nearby Blair Castle. 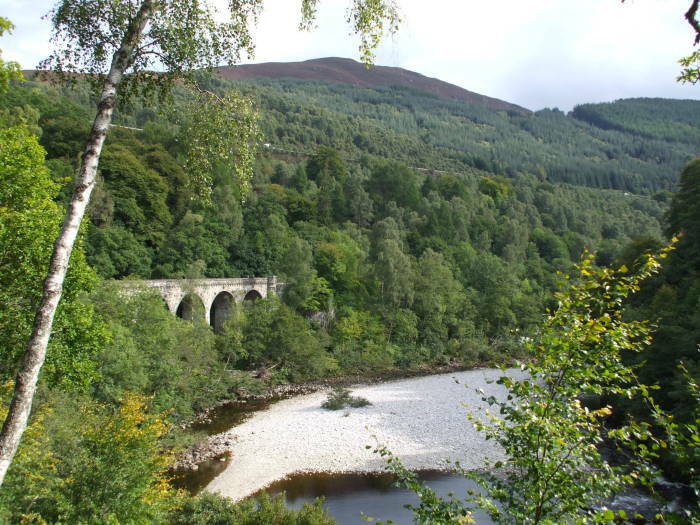 The railroad came to Pitlochry in 1863 and it became a significant tourist destination. Many of the older references may refer to it by its Scottish Gaelic name of Baile Chloichridh or Baile Chloichrigh. 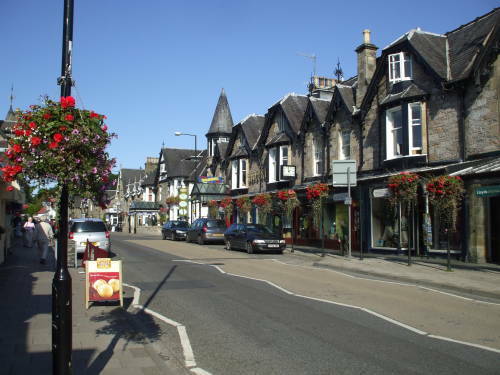 Pitlochry's High Street (that's "Main Street" to North Americans) shows its Victorian heritage. It's not a big town, with a population just over 2,500. 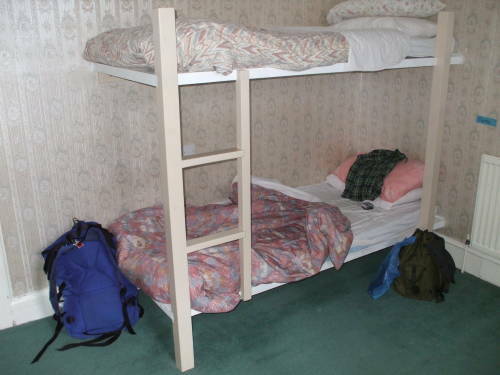 I stayed at Pitlochry Backpackers. It's near the center of the first picture below, in the corner building with the high conical roof. Here you see a typical room. I got there on a Scotlink bus, it's about 2.5 hours from Edinburgh to Pitlochry. I had a Scotlink pass allowing free travel on any five out of ten days. I only used it on four days, but it was still a much better deal than buying individual tickets. 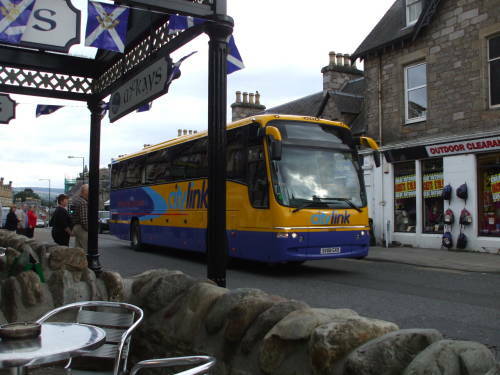 Above you see a Scotlink bus rolling through Pitlochry. The Strath Tummel hydro-electric power system generates a total of 245 megawatts of electricity from water flowing out of an area of 1,839 square kilometers receiving heavy rainfall. There are nine power stations, from Pitlochry on the east to the edge of Rannoch Moor on the west. 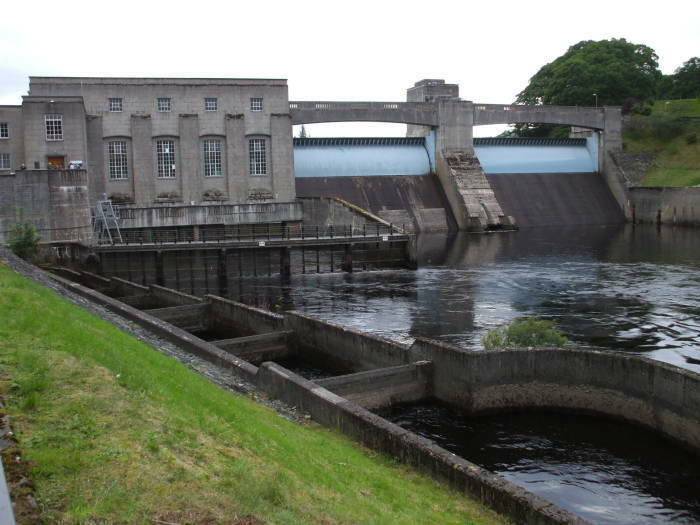 The 15 MW power station at Pitlochry is the sixth such hydroelectric station in a cascade, the water is used multiple times to generate power as it flows south out of the Highlands. The Pitlochry station has a large salmon ladder, seen in the foreground above. 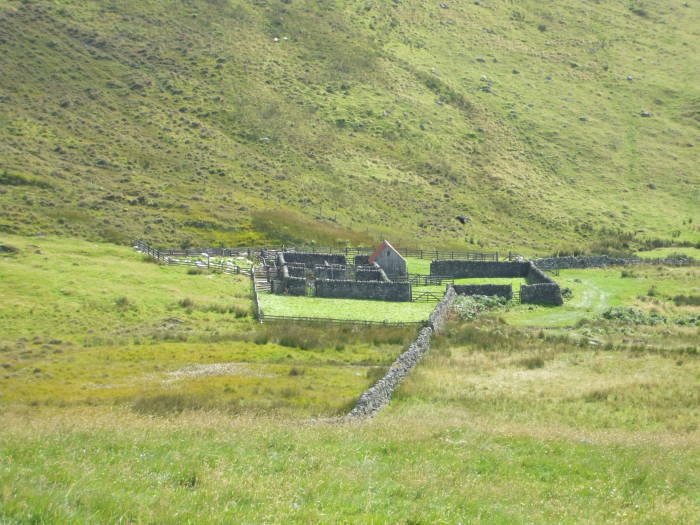 A 1943 Act of Parliament required the North of Scotland Hydro-Electric Board to preserve fish stocks in the waterways used for power generation. This fish ladder, completed in 1951, was the first of its type in Scotland. The ladder is made up of 34 separate pools, each 50 cm higher than the previous, with 1-meter openings below water level to allow the fish to swim up from chamber to chamber over the total 310-meter length. This being Britain, there are some megaliths around. See the three orange stars on the map below. 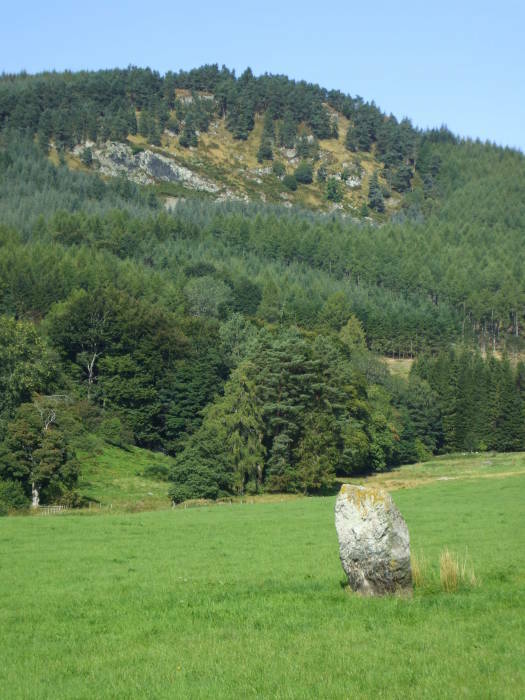 There are two isolated standing stones near the older village of Moulin just north of Pitlochry, and a stone circle on the northwest edge of Pitlochry. The rest of the pictures below show the Bealach Walk, starting to the north out of Pitlochry through Moulin, on north along the edge of a wooded area and out onto the open land further north and higher. Then continuing north in the general direction of Ben Vrackie, turning northwest to cross the ridge of Meall na h-Aodainn Mòire and Meall Uaine. Then down to the small village of Killiecrankie. From there down to the Soldier's Leap on the River Garry, and south along the bank of the river and Loch Faskally and into Pitlochry. 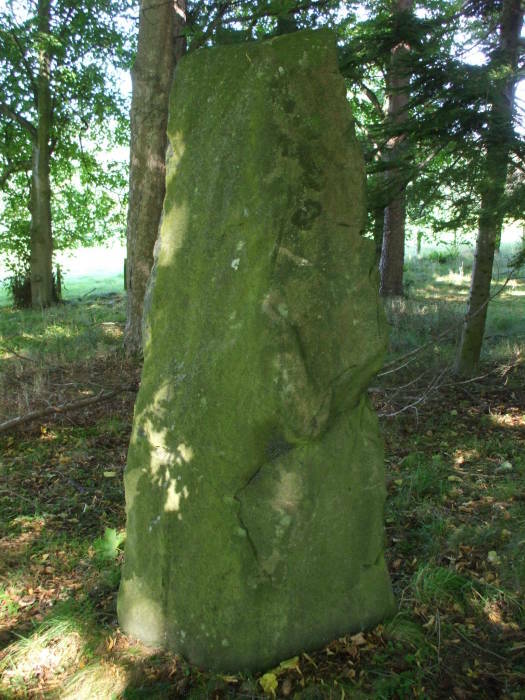 The first megalith is among some trees along the A924 road just 300 meters or so northeast of the village of Moulin. 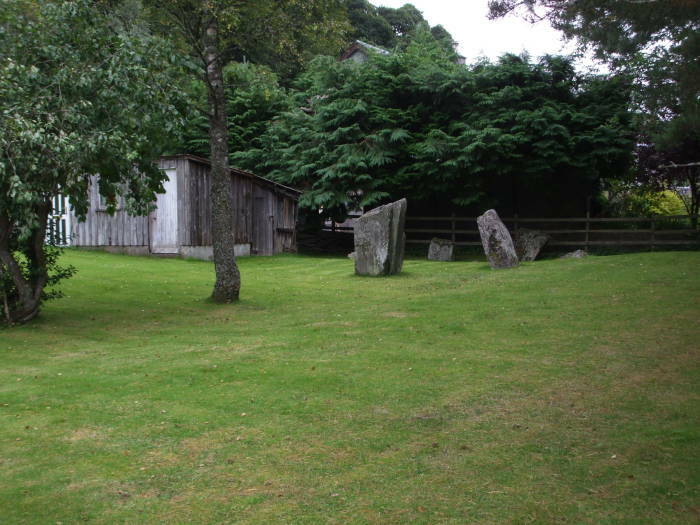 The megalith is at UK National Grid location NN 946 594, on the northwest corner of an intersection with a private lane and the A924. See my page explaining the National Grid coordinate system to see how it works, and how it makes it easy to find your way and specify locations. 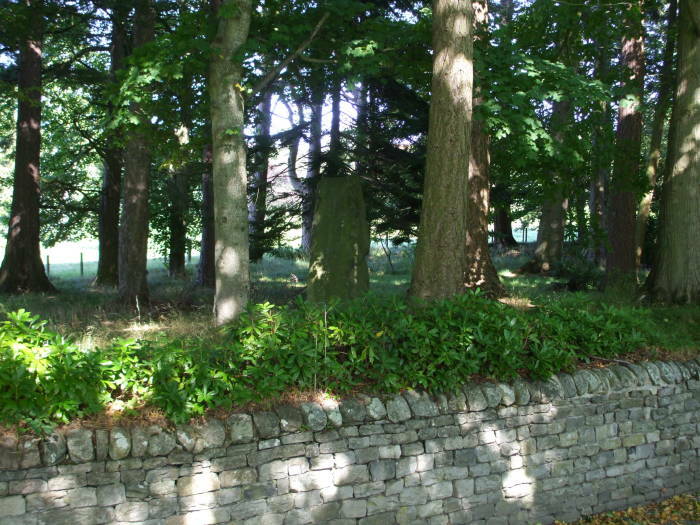 The second megalith is known as the Dane's Stone, a free standing stone in a field just northwest of the village of Moulin, at NN 942 594. From here the path continues uphill, to the right in this view and along the edge of the forested area. 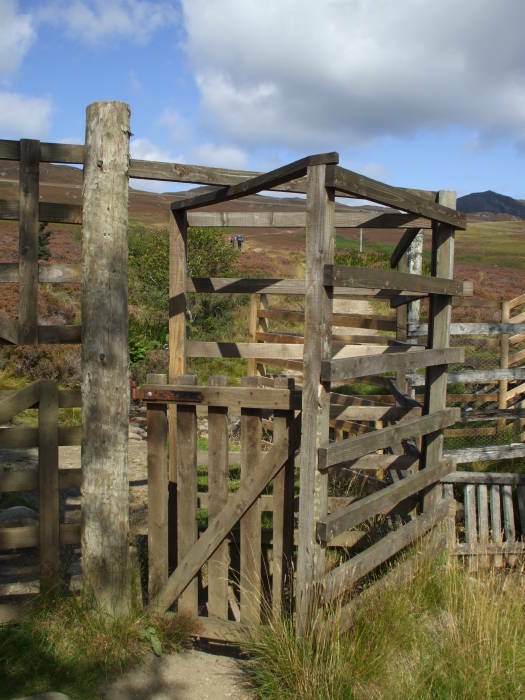 The path continues through this gate and onto the gently sloping open area climbing toward Ben Vrackie. The path continues north for about 600 meters before splitting. 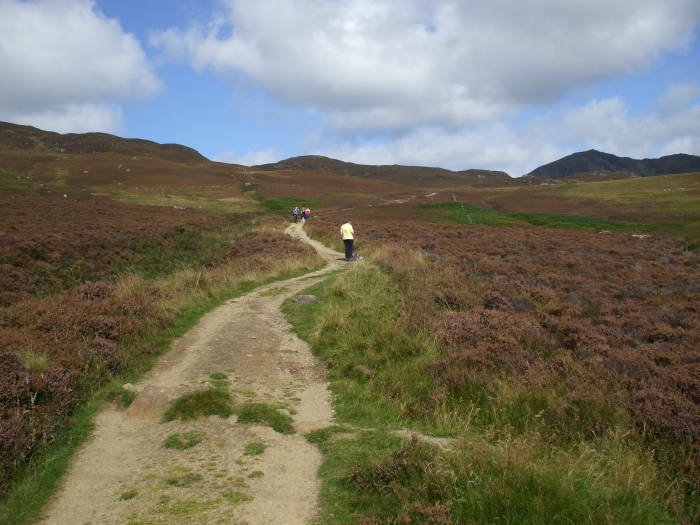 To the right, north-east, is the way to the summit of Ben Vrackie, or Beinn a' Bhreacaidh in Gaelic, at 841 meters. 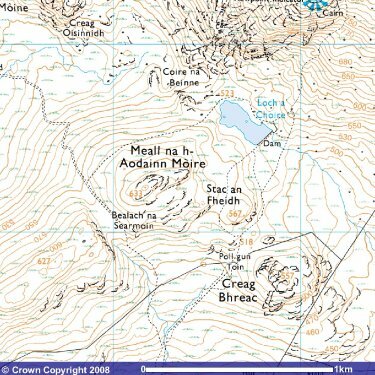 To the left, north and then turning north-west, the direction I'm going, the path crosses a ridge from Meall na h-Aodainn Mòire at 633 meters down to Meall Uaine at 600 meters. It descends a number of switchbacks and then joins a track leading down to Killiecrankie. The return along the river is shown here, but it's almost confusing as so many features are tightly packed along the steep slope down to the river through the Pass of Killiecrankie. The new highway is highest on the slope, immediately above the old road. Below that is the single-track rail line, and the foot path is below that, right along the river bank. There are nice views once the trail reaches the open land. 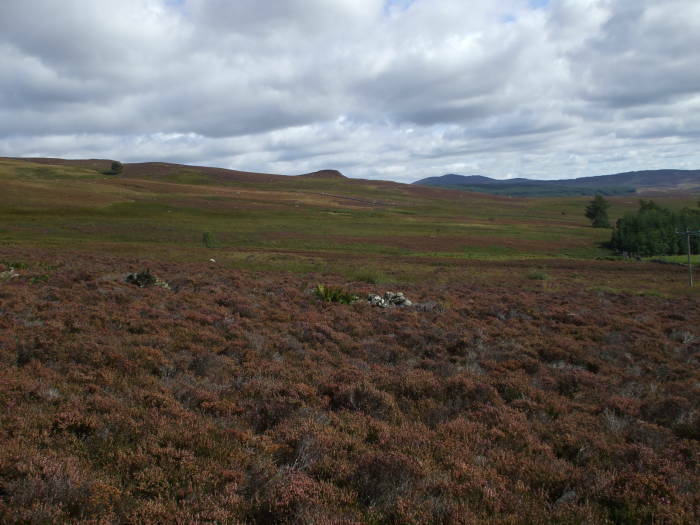 The heather is a dim purple in early September, not nearly as bright as when it's at its peak. 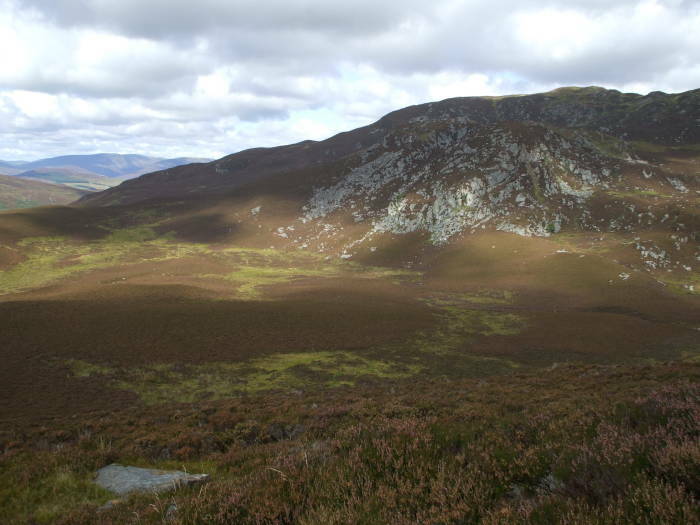 The summit of Ben Vrackie is visible ahead and to the right. 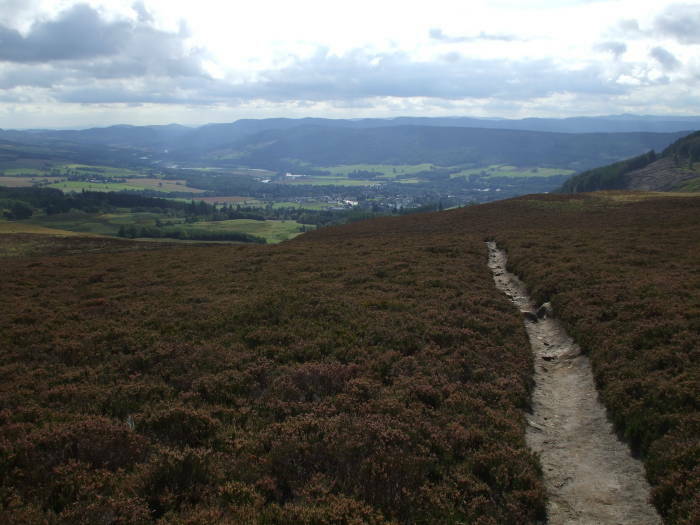 Here is the view looking back to the south, over Pitlochry and down the river valley beyond. Here is a more detailed view of the path split. 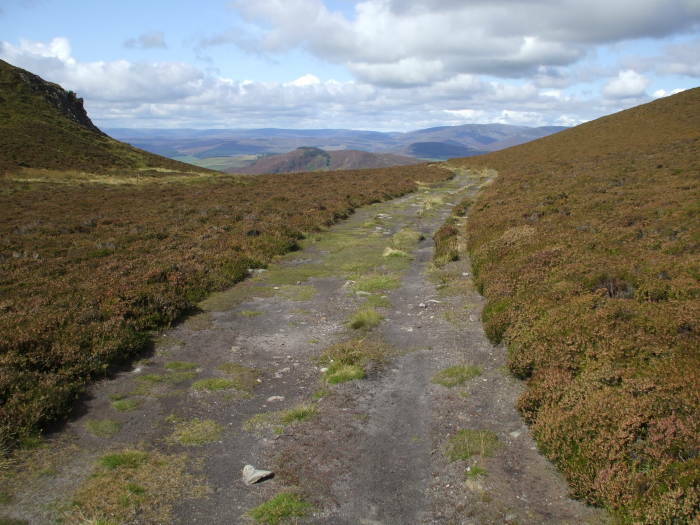 The path northeast to Ben Vrackie passes close to Creag Bhreac. 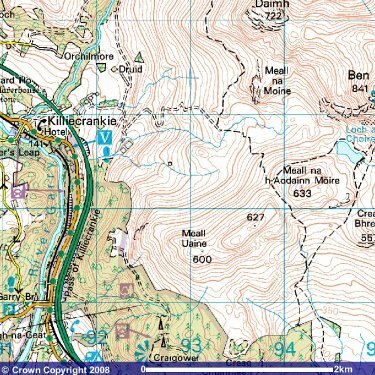 I'm taking the path to Killiecrankie, which goes through a stone wall and continues north through Bealach na Searmoin. That's Gaelich for Pass of the Sermon, as a rock outcropping there was thought to look like a pulpit. So, The Bealach Walk is the walk through that pass. The path climbs to Bealach na Searmoin. The view to the north into the Grampian Mountains really opens up as you walk through the pass. 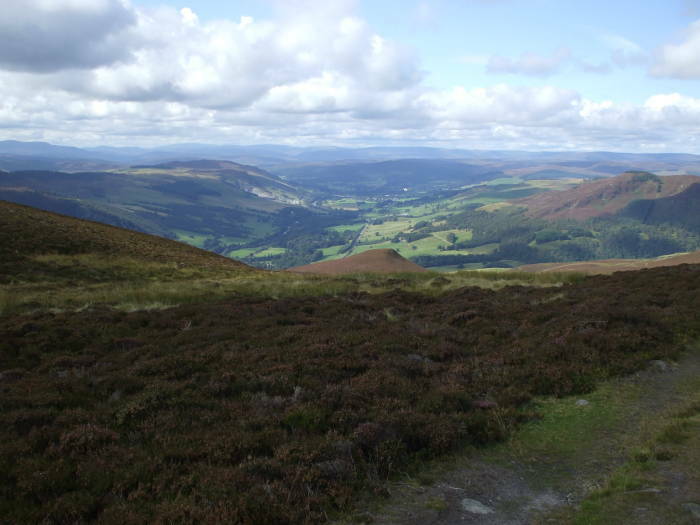 There's a great view down over Killiecrankie and beyond, to Blair Castle, and into the Grampian Mountains. Sheep are raised all over this area. 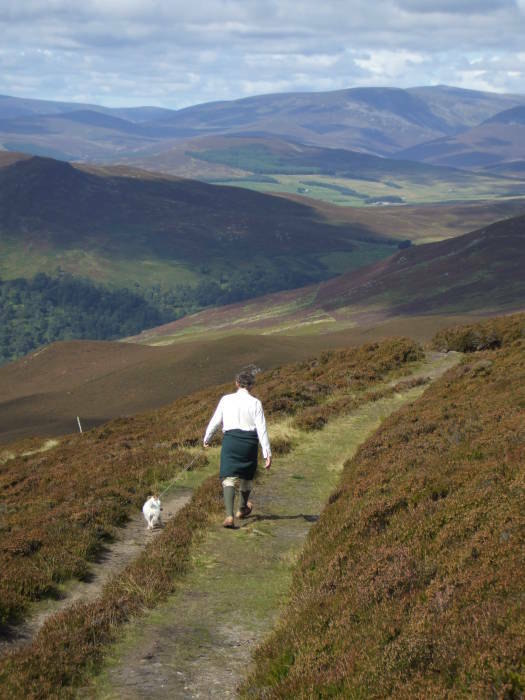 Do Scotsmen wear kilts while walking their dogs in the Grampian Mountains? This stone paddock has been here for a long time. 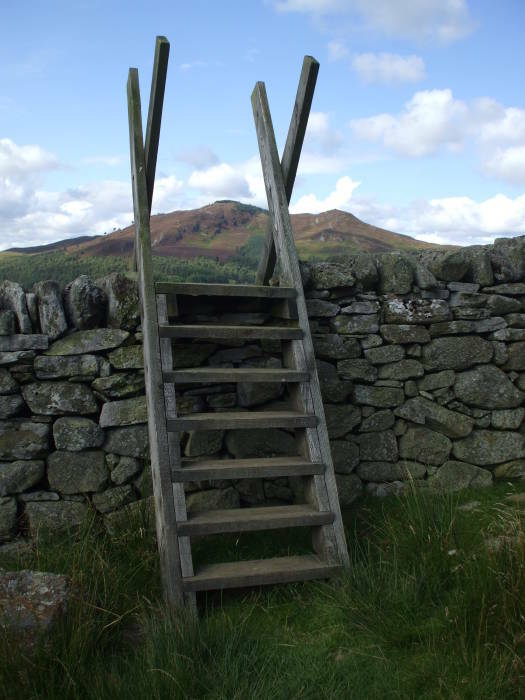 Stiles are provided to get you over the stone walls. 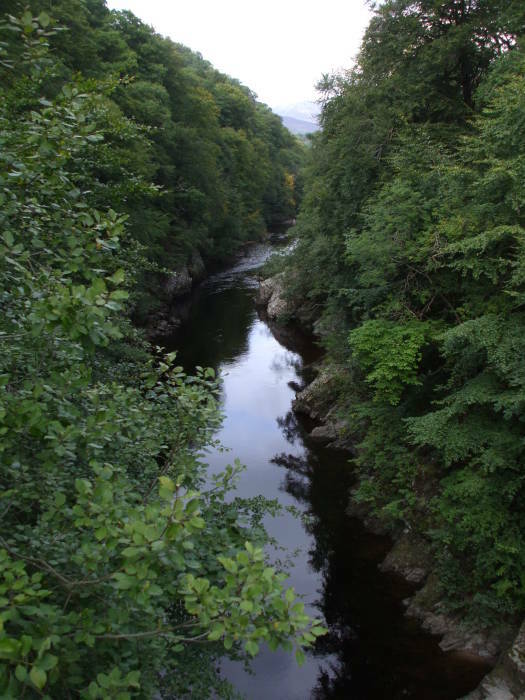 The Soldier's Leap is a narrow rapids on the River Garry just outside the village of Killiecrankie. 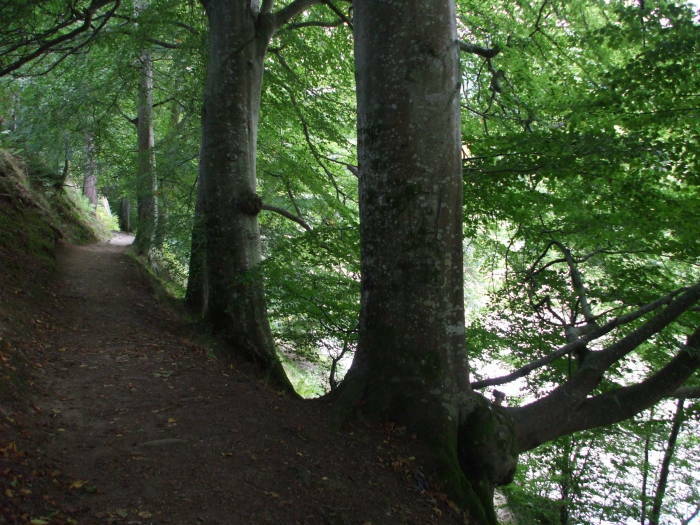 The Battle of Killiecrankie was fought in July 1689 and was part of the Jacobite Rising. King James VII of Scotland had become King James II of England, but the English were unhappy with a Catholic king. The English invited William of Orange, a Dutchman but a Protestant, to invade. He did, in 1688, and James fled the country in December. The English Parliament declared that James' flight was abdication, and it offered the throne jointly to William of Orange and Mary, James' Protestant daughter and William's wife. Scotland was divided. The Highlanders, mostly Catholic and Episcopalian and speakers of Scottish Gaelic, were generally loyal to James. The Lowlanders, mostly Presbytarian and English speakers, generally favored William of Orange. Those loyal to James were called Jacobites, from Jacobus, the Latin form of James. The Highlanders charged after an afternoon of stalemate, taking the government forces by surprise and overwhelming them in about ten minutes. 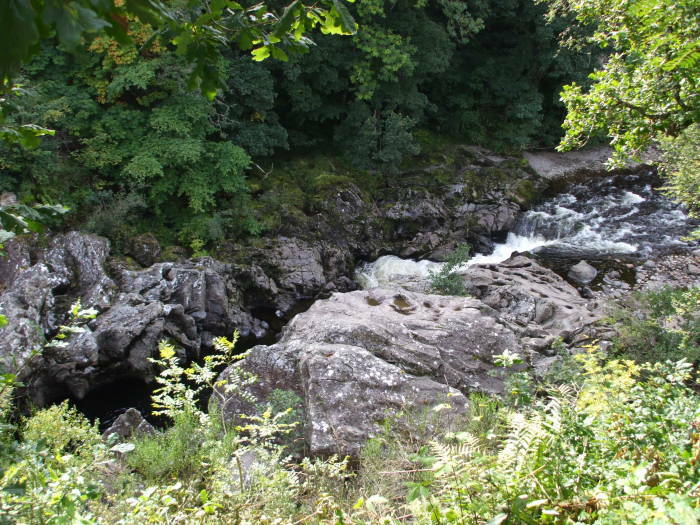 The legend is that Donald MacBean, a government soldier fleeing the opposing Jacobite forces, jumped over the river here, from the rocks on one side to those on the other. The battle was a victory for the Highland Jacobites, but at a very high cost. It was effectively the end of the Jacobite Uprising. From the Soldier's Leap overlook you can see the return path along the river. The path stays close to the river bank. The rail line is immediately above that, using the large arched brick viaduct visible here. The old road is just above the rail line, and the new highway is visible well above that. The River Garry is quiet here above Loch Faskally. You may see a large manor or two along the way. The path passes through some riverside parks along the way south. 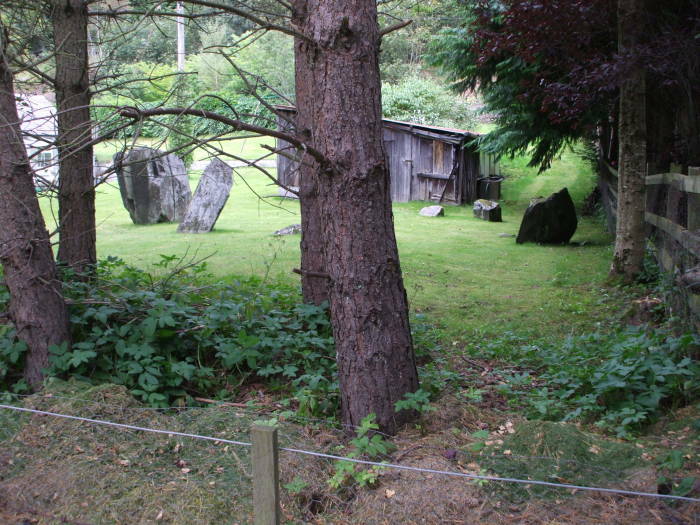 The third megalithic site around Pitlochry is a stone circle in the side yard of the Greengares B&B. 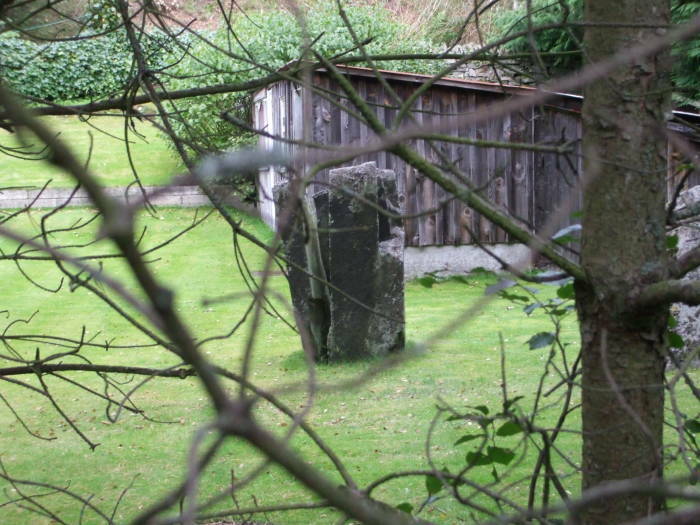 It's along the highway on the northwest edge of Pitlochry, at NN 930 587. This is at the east end of the intersection of highways A924 and A9. 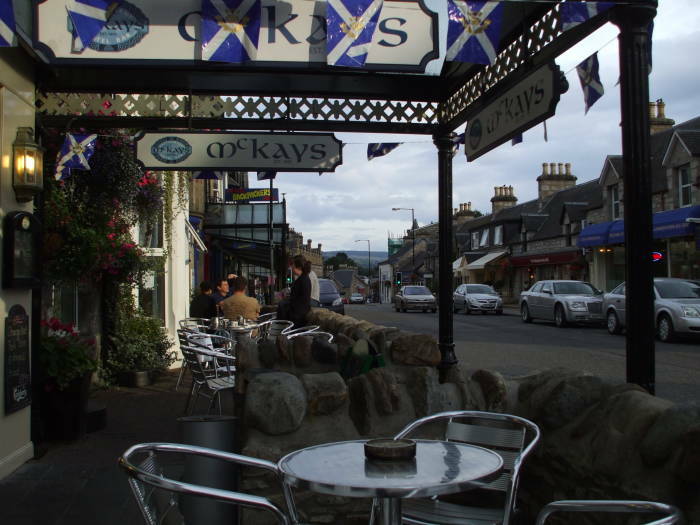 Back in Pitlochry you can get dinner at McKay's Pub, just across the corner from the Pitlochry Backpackers.